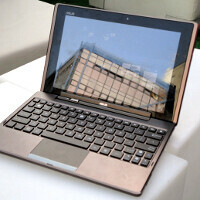 In its marketing materials at the recent Computex 2011 expo, Asus has slipped some words about its 2012 plans, and it looks that the Eee Pad Transformer 2 will receive a Windows 8 version as well, together with an updated Android one. Microsoft demoed Windows 8 recently, which is supposed to run on everything from the smallest tablet to the large server, and adapt its interface accordingly. For tablets we have Live Tile-based interface, similar to what current Windows Phone 7 handsets sport, just with larger tiles, displaying app information in real-time. Windows 8 should also sport its own application store, instant boot times, and will be able to run on the dual-core Tegra 2 chipset that is in the Eee Pad Transformer. The Asus Eee Pad Transformer 2 will supposedly be thinner and lighter than the current one, but will again sport the iconic keyboard dock, and is rumored to keep its decent price, while the current model becomes cheaper. Too bad we will have to wait until 2012 when Windows 8 hits in its full touchy-feely glory, but we have the sneaking suspicion that there will be a lot of Windows 8 gear as early as CES 2012 to feast our eyes and hands on. Same here. I hope they also add a usb/mhl to the tablet and come out with something around a 12" upgraded screen and or hybrid screen but that might be asking too much. Cool idea, having a PC with Linux and Windows, I like being able to use both. Oh man, I hope this happens. I also hope that it uses Win8 Metro when as a tablet, and then when docked it switche to the full Windows experience. That would be off the hook. Maybe merge PadFone into it as well? So the "Fone" part comes out running WP7. Oh man, Asus needs to hire me, I just want to make cool stuff in their labs. Wait so it isnt coming out this year?